AT Audio is Responsive Audio website template. 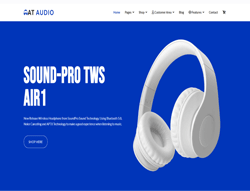 This template was designed to meet all the design requirements of audio templates, headphone shop online or shopping cart joomla templates. Audio website template builds with powerful framework under 100% responsive layout (support mobile / tablet version) based on latest Bootstrap CSS Framework, Support Font Awesome and K2 extended style. Aside from Google fonts that stand out of the color schemes, there’s also J2Store templates integration so users can either view your products as they browse through the latest collection in online shop joomla! template. Furthermore, audio templates provide flexible homepage which includes boxed and full width layout and 4 color styles. Audio website template designs that follow the latest in design trends to tailor fit the music joomla! template. Setting up the two column pages is pretty easy too. This is because you can add or edit content with the user-friendly Admin Panel that’s easy to learn how to use. Pretty soon you’ll be in control of what you want visitors to see and how you want the content to appear.